A great starter home or rental! 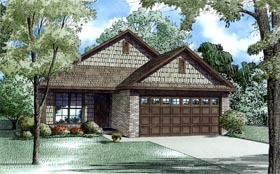 The boxy design of this home will allow for a more cost efficient build while still giving you great curb appeal. An open floor plan between the Great Room, Dining Area and the Kitchen lends a spacious feel where conversation can carry through each space. The Master Suite has a boxed ceiling, a private bathroom and a large walk-in closet. Bedrooms 2 and 3 each have their own large closet with a bathroom in the hall to share.